Knowledge has always been essential to human civilization. 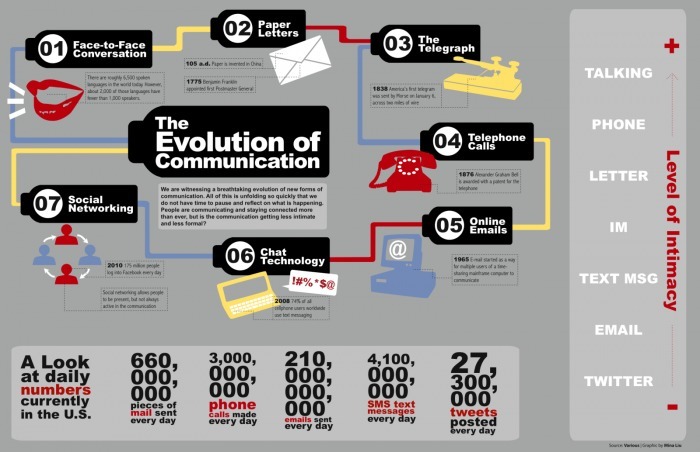 The evolution of knowledge can be traced to the ways in which it is communicated, or transferred. In prehistoric times, knowledge was transient and passed down orally. Despite these fundamental differences, a constant thread in knowledge transmission throughout history has been the collaborative process. With the inventions of paper, the printing press, and networked computing, the ways in which knowledge is accumulated and transmitted has changed considerably across history. This “evolution of knowledge” and the concept of collective intelligence are overarching themes that should be addressed in a discussion of open source and big data. The term “collective intelligence” generally refers to the cognitive abilities of a collection of individuals. Several of the works discussed in the class (e.g., Networked, Convergence Culture, and Semantic Sphere) discuss the opportunities involved in online collaboration. Pierre Lévy refutes the oft-cited argument of “collective stupidity”, which states that crowds are mostly stupid (this of course never refers to ourselves, but to someone else). The principle of open access does not prevent vandalism or other forms of “stupidity”, but collaborative conversation remains a highly productive method of knowledge transfer. Henry Jenkins states that collective intelligence is more than just the sum of the collective belief; it is the collaborative process of knowledge transmission and creation. It is an active process of knowledge transmission and generation, where everyone has the potential to contribute. Indeed, most of the knowledge that we possess comes from others – we benefit from shared experiences and collaborative learning through family, education, media – as well as through established processes such as democracy, the market, and science. We have always needed knowledge, but before the 20th century, the evolution of knowledge was slow. Today, the means of transmitting knowledge are evolving quickly. Hieratic knowledge: Development of writing and permanence in knowledge transmission. Enlightened knowledge: The ability to reproduce symbols; invention of the printing press. Hyper cortical knowledge: Further advancements through algorithmic writing and ubiquity of data. The stages in the history of communication are relevant to a discussion of the modern transmission of knowledge and collective intelligence, as they trace the evolution of knowledge transmission. As Pierre Lévy states in a YouTube interview, since our collective intelligence is based on our ability to speak, every technology that augments our language ability will also augment our collective intelligence. We should take advantage of the communication technologies we have accessible and understand how to better categorize ubiquitous data – as well as harness it – to foster greater collective intelligence. Wikipedia is guided by traditional principles that govern the way the Encyclopedia Britannica is structured, but the way that information is created in Wikipedia completely sidesteps barriers to content creation faced in the traditional model. Jenkins (2006) distinguishes collective intelligence from the “expert paradigm”, stating that online communities are demonstrating a movement away from the traditional reliance on expert sources of knowledge. Instead, collective intelligence is garnered from multiple sources under the premise that “each person has something to contribute, even if [only on] an ad-hoc basis” (Ibid:53). This idea can be applied to the activities of Wikipedia contributors. Clay Shirky (2009) describes Wikipedia more as a collaborative process than as a final product, where the majority of users add minor content, rather than large portions of articles. Similarly, Rainie and Wellman (2012) view the strength of Wikipedia articles in the extensive peer review and collaborative process that is involved in their creation. The concept of a “final product” is different in an open access model, where an article can be updated as events change and as content is verified or disconfirmed. Elliott relates the concept of stigmergic communication to the creation of Wikipeida articles in a discussion of the open source software movement. Stigmergy originally related to the ways in which termites coordinated the modification of their environment to construct a nest. In the hyper-cortical stage of communication, stigmergy can be applied to the ways individuals communicate with one another to modify information in the online environment through ad-hoc contributions. Elliott states that traditional communication methods (face-to-face) are not conducive to discussions regarding large amounts of data, as there is so much complex information to negotiate. Without the mediation of a system to categorize this information, the collaborative process could undermine itself. Should the creation of media and transmission of knowledge reflect these developments in the historical evolution of knowledge? Despite the fact that Wikipedia is a thriving online community, barriers exist in the academic world to recognizing the validity of the open source model. A recent article in Nature discussed how the open access movement is affecting peer-reviewed journals. It raises the concern of whether academia should start evaluating the value of data based on how often it is cited (how useful it is in the academic community) rather than its success in gaining entry into a reputed academic journal. While this is a complex issue and would take time to implement in established academic peer-reviewed journals, as a general principle, we should utilize collaborative technologies and focus on sharing, rather than restricting content in a knowledge society. Conforming the production of knowledge to a previous stage of communication technology hinders the curation of collective intelligence. The idea of moving away from the historical model in favour of open-source access has been included in coverage of bookless libraries, MOOC courses, and of course the highly-publicized Aaron Swartz case. It will be interesting to observe the shift in discourse surrounding open access in the months and years to come – and how this impacts the way we access and create information. Elliott, Mark. (2006). Stigmergic collaboration: The evolution of group work, M/C Journal, 9(2). Jenkins, Henry. (2006). Convergence culture. New York: New York University Press. Lévy, Pierre. (2011). Creative conversation. In The semantic sphere: Computation, cognition and teh information economy (pp. 108-135). Wiley: Hoboken. Shirky, Clay. (2009). Here comes everybody: The power of organizing without organizations. Penguin: New York. Rainie, Lee & Wellman, Barry. (2012). Networked: The new social operating system. Cambridge: MIT Press. Henry Jenkins premises Convergence Culture by refuting the utopian, futuristic “black box” theory. He explains the concept of convergence as a current, rather than futuristic phenomenon where new and old media collide, yet coexist. Convergence culture marks a shift from the audience’s role as a spectator to an active participant in media culture. This is changing the power that corporations have over media content: in a convergence culture, control is distributed in a “top-down” and “bottom-up” structure, from consumer to corporation, and vice-versa. Jenkins first discusses the concept of collective intelligence in the context of online “spoiler” communities that collaborate to determine the outcome of the Survivor reality series. Collaborative tactics range from gossip to in-depth investigative research beyond the mainstream media. Jenkins distinguishes collective intelligence from the “expert paradigm”: while “experts” possess a mastery of an entire subject or field, collective intelligence is garnered from multiple sources under the premise that “each person has something to contribute, even if [only on] an ad-hoc basis” (Ibid:53). When Survivor’s plot was largely spoiled through tips from an anonymous contributor, many users on the website argued that they were robbed of the collaborative learning process. The investigative practices of communities also exert influence on the producers of Survivor’s content, who must modify content so it is less predictable. Jenkins (2006) elaborates further on audience influence in his discussion of American Idol. He addresses how television is being shaped by “affective economics” through the lens of the consumer-brand relationship on the show. He asserts that while “zappers” and “casuals” comprise the majority of viewers, “loyal” viewers are likely to recruit other demographics, and form a lifelong emotional commitment to the brand (Ibid:74). While the Survivor and Matrix fan groups constitute a small portion of the target audience, corporations should be sensitive to their needs. These groups are willing to invest their resources into either the success or failure of the brand, depending on the corporation’s willingness to engage with them. Jenkins (2006) discusses “transmedia storytelling” in the Matrix, revealing that the film is only a component of the story. Unexplored fragments of the movie are pursued through platforms beyond the film. These storylines have inclusive contextual elements that allow users to engage in collective decoding practices and create their own content. Jenkins points out that criticisms of transmedia storytelling often fail to understand the cultural context of the content, and suggests that a new standard is needed to evaluate the quality of these productions (Ibid:123). Jenkins (2006) distinguishes between the concepts of interactivity and participation in his discussions of Star Wars and Harry Potter. Convergence culture allows consumers to actively participate in media content, allowing them to appropriate power previously situated in the hands of media corporations by producing fan content. Jenkins suggests that media industries can either embrace grassroots expression, or oppose it at the risk of alienating their consumer base. Rather than viewing fans as infringing on copyright through amateur film, corporations should value their loyalty and harness their willingness to contribute to the brand’s success. Jenkins (2006) then addresses the intellectual property debate by bringing the issue of literacy into consideration. Online communities dedicated to producing fan fiction allow children to develop their imaginations, and also serve as “scaffolding” that develops writing and editing skills outside of the classroom. Writers undergo a “peer-review” process that Jenkins suggests is more advanced than inside a classroom, where assessment consists only of the teacher’s evaluation of the student. Jenkins (2006) finally examines the relationship between popular culture and political influence and involvement. Changes in communication systems enable individuals to participate more actively in the political sphere. The popularity of “infotainment” news sources calls for citizens to develop critical skills in synthesizing the information. Jenkins also discusses the balance between maintaining a political presence on “push” and “pull” media. 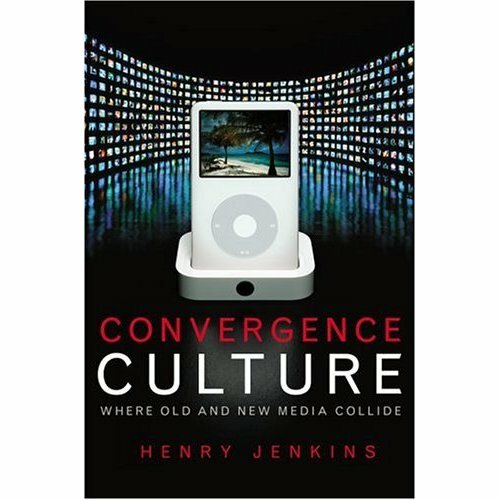 Jenkins’ (2006) novel is a comprehensive study of the cultural aspects of media convergence. Jenkins selects relevant case studies that illuminate the relationship between media convergence and Pierre Lévy’s theory of collective intelligence. His consideration of online fan communities shows the relevance of their activities from educational, political, religious, economic, corporate, and legal perspectives. Readers unfamiliar with online fan communities and sub-cultures may approach Convergence Culture with skepticism. Jenkins focuses his analysis on minority fringe groups obsessed with rehashing episodes of Survivor and writing alternate storylines from the Harry Potter series. However, he constructs a convincing argument throughout the book that legitimizes academic and commercial consideration of their activities. The discussion of teamwork within online communities is one of the strongest components of Jenkins’ (2006) defense. Jenkins asserts that collaborative learning is underemphasized and discouraged in school, yet is ironically central to effective performance in the workplace. McLoughlin and Luca concur with this idea, suggesting that “professional knowledge” requires elements of “independence, dependence, and interdependence”, where the end goal is interdependence, rather than independence within the organizational culture (2002:573). Regardless, schools continue to view the practice of collective intelligence as “cheating” and focus instead on fostering the development of expert knowledge (Jenkins, 2006:133). Jenkins’ analysis exposes the shortcomings of the educational system, which seems trapped in an archaic method of teaching that is detached from the way people formulate ideas in the “real world”. Jenkins’ (2006) support for an educational philosophy grounded in the principles of collective intelligence continues in his discussion of the real-world applications of virtual experiences in the final chapter. Jenkins claims that the high school student running for election in the virtual Alphaville gleans an intimate understanding of the democratic process (Ibid:239) similar to a student running for student body president, but he does not address whether actual practices, such as presenting ideas virtually, could be transferred to the public sphere. Haskell (2002) distinguishes between the concepts of “learning” and “transfer”: while learning is comprised of theoretical knowledge, transfer involves the ability to apply a learned concept or skill. The virtual world arguably provides an environment that grounds students’ knowledge of these concepts, but this raises the question of whether they are deprived of the more practical skills involved in communicating. Jenkins does not address this consideration, but a study by Clark and Jones (2009) found that students who completed online sections of a public speaking course did not differ from their counterparts who completed in-class sessions. Jenkins’ assertions are extremely important considerations to apply in response to the increasing dominance of computer technology in educational institutions. However, it was only through secondary research that I was fully convinced of this; Jenkins’ discussion of Alphaville would have benefited from citations of actual studies on the educational benefits of participation in virtual communities. While individuals in online communities may only be “playing”, they have been shown to exert powerful force on powerful corporations and institutions, and pose a legitimate threat to presidential candidates and Hollywood studios alike. Jenkins (2006) refers to this power in his assessment of the simultaneous “top-down” and “bottom-up” system of media production between corporation and consumer. Jenkins draws on Lévy’s assertion that new structures of power arise through the collaboration in a network society, applying this concept to his economic analysis of media and content ownership and the democratization of content creation through new technology. His discussion of the power and influence that “loyals” have over a brand exemplifies this concept. The dedication that these groups exhibit toward corporate brands by freely contributing their ideas and energy raises the question if this is a sustainable model, or if these “loyals” will eventually demand compensation or recognition for their efforts. Jenkins (2006) mentions that these fans are the least willing to cede ownership of their content to major studios, but does not address whether he thinks this will be the extent of the problem, or whether fans will begin to demand something in exchange for their intellectual labour. Despite Jenkins’ acknowledgement that corporations “see fans as…providing a low-cost means of generating new media content” (2006:143), he fails to further address how the problematic of content ownership (in terms of the consumer as contributor) could be legally addressed. While the masses can exert major pressure through their buying power, the fact remains that corporations that understand the power of participation within convergence culture can use the ideas of “loyals” to generate revenue. Sinnreich alludes to this shortcoming in his review, “Many of [Jenkins’] business-oriented prescriptions, predictions and analyses fall flat”, claiming that Jenkins seems to exhibit a tension between his role as proselytizer and member of online fan culture (2007:46). Jenkins’ justification of the system as one that benefits both consumer and producer seems detached from reality. While Jenkins touches on the idea of a “fan’s sense of ownership over a particular property”, he is quicker to offer justifications for the existence of fan content, rather than answer the question of whether the fan should have partial claim to legal ownership of the content (2006:200). Jenkins’ arguments convinced me that while corporations technically own the rights to consumer content, fans contribute original ideas that can considerably strengthen the brand. While I acknowledge that fans willingly create content without the expectation of ownership or compensation, it remains problematic that this system is structured so that corporations can use the collaborative efforts of their fans for profit and recognition. While corporations can profit from fan content under the protection of copyright, fans seem to have little to no rights simply because they are producing original content from a copyrighted idea. Further discussion of the legal implications of this issue would have provided Jenkins’ analysis with more depth. Regardless of my criticisms that further exploration and justification would have reinforced the validity of Jenkins’ arguments, Jenkins is ironically limited to the confines of the print medium to explain the complex phenomenon of media convergence. He succeeds in providing a comprehensive overview of the cultural implications of technological convergence despite this, and raises important considerations about the legitimacy and utility of online fan culture from various perspectives. Clark, Ruth & Jones, David. (2009). A comparison of traditional and online formats in a public speaking course. Communication Education, 50(2), 109-124. Haskell, Robert. (2000). Transfer of learning: Cognition and instruction. San Diego: Academic Press. McLoughlin, Catherine & Luca, Joe. (2002). A learner-centred approach to developing team skills though web-based learning and assessment. British Journal of Educational Technology, 33(5), 571-582. Sinnreich, Aram. (2007). Come together, right now: We know something’s happening, but we don’t know what it is. International Journal of Communication, 1(1), 44-47.